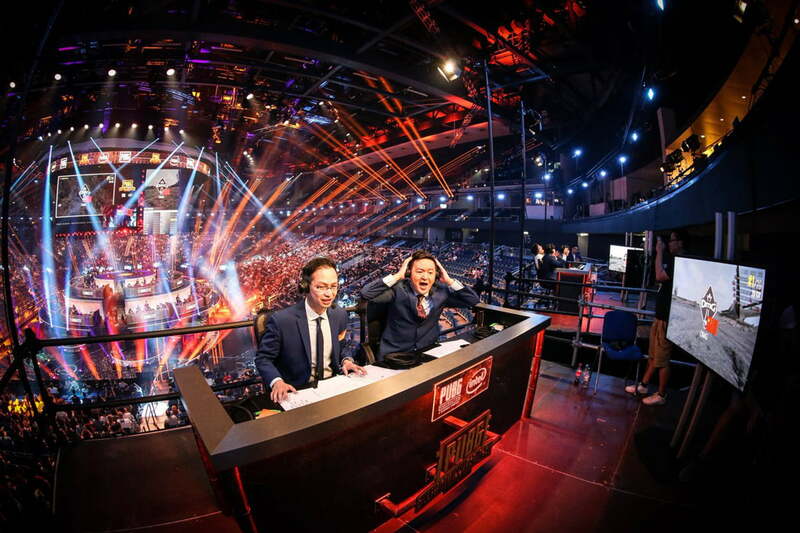 Later that day, Moseley will step into a booth at Berlin, Germany’s Mercedes Benz Arena to give color commentary for the opening day of the PUBG Global Invitational. A little over a year ago, Moseley, 31, was a private security investigator for a pharmaceutical company in Calgary, Canada. Now, a live audience, and hundreds of thousands of viewers at home, will hear Moseley’s buttery baritone. Playerunknown’s Battlegrounds (or PUBG) is a battle royal game where one hundred individuals, alone or in teams of up to four, paradrop into an otherwise deserted landscape. When they land, they must grab weapons and fight all opponents in a bid to become the last player, or team, left alive. Unlike its more comical competitor, Fortnite, PUBG is built around a realistic gunplay that includes bullet drop and bullet speed and rewards tactical thinking. It’s a serious game that asks players to think carefully about recoil, projectile penetration, and the noise their footsteps make as they approach a victim. Like many of the 50-odd million people who have bought PUBG since it went into early-access in spring of 2017, and the 400-odd million who have played it, Moseley was taken by the heart-stopping tension of a fight to the last man. He began streaming the game on Twitch and uploaded videos to YouTube. His popularity rocketed with the game, so he quit his job to focus entirely on his PUBG career. Looking sharp in a black suit, standing in the caster dressing room, it’s all a bit surreal for Moseley. Not just because of the speed at which PUBG changed his life, or because the game’s publisher flew him out to Berlin—Berlin!—and have him staying at the Ritz-Carlton. It’s kind of amazing the event is happening at all. What makes PUBG’s success even more amazing is this: it’s a buggy mess. PUBG began as a low budget spin-off of a user mod to the military simulation game ARMA III. The lead design of PUBG, Brendan Greene (aka Playerunknown), was on welfare only a few years prior. The game doesn’t have the polish of a AAA title. A million sales would have looked pretty good in the eyes of Bluehole, the game’s developer — but by September 2017, PUBG had moved 10 million copies. Today, it’s the fifth best-selling video game of all time. That PUBG could be an eSport, in other words, is literally a joke. Yet it’s hosting a World Championship anyway. The tournament hosts 20 teams from around the world with two million dollars of prize money on the line. Another parallel event put one million dollars of charity donations up for grabs. The stakes are huge. Proving itself as a viable eSport would be a boost for PUBG which, though still ridiculously popular, has lost ground to Fortnite in recent months. For the players, too, the pressure is immense. Their position on the leaderboard means the difference between continuing part-time careers as semi-pros, or ditching their nine-to-fives to become true professionals. Sharing first place, and the $400,000 prize, would be life-changing for most anybody, but the members of Team Gates—who go by Mortify, Mossy, Cillo and Exko— are in particular need. Only Mossy played full-time prior to the team’s arrival in Berlin. The others work day jobs as cooks, or in warehouses, or are unemployed. Mossy, a wide-eyed Kentuckian whose real name is Tyler Moss, tells me they’re going to win. Not just one game either, but the entire tournament. It’s a bold statement to be sure, but Gates is the top qualifier from the North American region. They have reason to be confident. Or, rather, they had reason. The team came in last at Gates’s final warm-up tournament before Berlin. Still, Mossy and the guys insist it was just the wake-up call they needed. They’re ready. This is their moment. Every little kid’s dream, of playing video games as a career, is right there. All they have to do is win. The opening game, unfortunately for Gates, doesn’t go to plan. Gates is wiped out in 17th place, and the guys are forced to watch as another North American qualifier, Ghost Gaming, takes first. Was Ghost’s win down to skill? To individual guile? To a superior game plan? It’s hard to say. Clearly all of the players here possess incredible skill. They can spot enemies that appear as mere dots on the horizon, dodge shots like a superhero, aim with pinpoint precision, and compensate for recoil like it’s not even there. But at the end of round one, the map’s playzone gives Ghost a clear advantage, forcing Ghost’s remaining opponents out of cover. Aside from bugs, the random movement of the playzone is often cited by PUBG’s critics cite. Players can’t survive outside the playzone, but there’s no way to predict how it’ll shrink as the match progresses. Random weapon spawns also introduce an element of luck. Players at home often drop into a high traffic areas as a way for a fun, quick game, but all too often a player might find herself literally bringing a crowbar to a gunfight. Statistically, PUBG’s random elements even out as multiple games are played, but at the Invitational the teams only play eight games in each of the two game modes—first person and third person perspective (FPP and TPP). That’s not a large enough sample size to level out the game’s randomness. To combat that, the Global Invitational changes the playzone settings and the loot spawn rate. The playzone moves more slowly and each new zone is more likely to occur near the center of the previous circle, decreasing the likelihood that one team must travel across the entire map while others lie in wait. Powerful weapons also spawn more frequently, to ensure players are well-equipped in their climatic final battles. Another problem lingering over PUBG-as-eSport is the audience, and how to engage it. Most spectator sports are competitions between two teams or individuals. Player one won a point; player two made a mistake. At the Invitational, viewers must track twenty teams, 80 players, multiple engagements happening across a single map, and an ever-shrinking playzone. How can the audience enjoy it all? Bluehole is struggling to find a solution. The CEO, Hyo-Seob Kim, suggested there might be announcers for each individual team in the future, and it’s conceivable that, in the future, viewers might be able to watch and control their perspective as a spectator through PUBG’s own software. DOTA 2, among the world’s most popular eSport games, already supports that. For now, PUBG has tackled the problem by broadcasting with split screens, showing different perspectives during fights, and a dynamic map that indicates the location of the action. Still, day one of the tournament is a blur of exploding grenades. Team Gates finishes in 19th, a huge disappointment. Day two is not much better for the top North American qualifier. Gates finishes in 18th, putting them dead last on the third-person perspective (TPP) standings. The four players from Gates take home a total of just $2,500. Before the tournament began, Bluehole held an hour long meeting with the teams, explaining the bugged out parts of the map and other exploits that, if taken advantage of, would be grounds for disqualification. That such a meeting was necessary speaks to the remaining issues that PUBG faces. Yet the tournament still felt like a success. It was frantic, engaging, and tense — everything a popular sport needs to be. Then Dr. Disrespect and Shroud showed up. At six foot eight Dr. Disrespect, the Twitch-famous alter ego of Guy Beahm — a former Call of Duty level designer — towers over the minders and PR people on the second floor concourse of the Mercedes Benz Arena. He and his fellow Twitch star, Michael Grzesiek, better known as Shroud, seem a little nervous. Outside the arena, hundreds of fans are waiting in the near-hundred degree heat for a chance to get an autograph or snap a selfie with Doc and Shroud. Later the pair, along with 40 other prominent streamers from around the world, including Ninja, will partner with tournament pros for a one million dollar charity tournament. Is the game eSports ready? The Doc says yes, it is, though with qualifiers. Both Shroud and the Doc have an interesting relationship with PUBG. They play it for hours every day in front of a Twitch audience of 20,000 to 70,000 simultaneous viewers. Both rose to Twitch prominence thanks in large part to PUBG, the game they most frequently play. And their continued focus on the game has helped PUBG weather the negative PR surrounding its bugs and the release of Fortnite. They are, in a sense, ambassadors for PUBG. But they’re also two of the games harshest critics. The Doc, who brags about being a two-time video game champion in the mid-1990, spends much of his stream raging over PUBG bugs that occasionally rob “the two time” of victories. And Shroud, a former competitive Counter Strike professional, is often critical of the game’s inherently random nature. Is the game eSports ready? The Doc says yes, it is, though with qualifiers. He has concerns over whether eight games are enough for a PUBG tournament. He’s also not sure if the four-man squads are the best way to play. “The answer for me will always be no,” Shroud says without flinching — and he’s about to unintentionally prove his point. After the meet-and-greet, Shroud and Doc take the stage, fire up their streams, and drop into a game. They’re paired with two pros from Ghost Gaming. The arena is abuzz with anticipation. More are watching on Twitch than at any point in the tournament so far. While Doc’s personality is core to his appeal, Shroud is famous for his exceptional game knowledge — but Shroud has never been tested against other professionals. Will he hold his own against the game’s top players, or will the pros expose Shroud? Both Doc and Shroud hold up well, and by game three, Shroud is feeling it. At one point he executes and incredible snap shot, downing an opponent on the roof of a nearby building in the blink of an eye. He then throws a grenade onto the roof to finish his kill. It looks like a perfect throw, and as the world watches on the top-down spectator camera, the grenade lands right on top of two players and explodes. Yet they survive. Here, at the exact moment PUBG has its biggest ever audience, during an otherwise flawless event, the bugs have emerged from their burrows. The company put out a press release claiming the grenade had bounced out of range of the two rooftop players. What viewers had witnessed was an illusion of perspective, as the grenade exploded between the players and the camera. But the damage was already done. The internet was ablaze. The “Shroud nade,” as it has come to be known, highlights PUBG’s ongoing public relations problem. Bluehole struggles to manage expectations. It misses opportunities to be transparent about ongoing issues that the company plans to fix, and fails to generate the empathy the game’s rags-to-riches deserves. PUBG, the creation of a man formerly on welfare who built success out of nothing, should be the lovable underdog. Yet Fortnite, a game made by a large and well-heeled developer, has stolen its thunder. It looks fun, positive, and transparent while PUBG appears stale, divisive, and inaccessible. The Global Invitational has likely reinforced Greene’s opinion. It brought together dozens of professional players, and millions of viewers, in a multi-day tournament that could’ve been the bedrock of the game’s eSports reputation. Yet much of that goodwill was destroyed by a single errant grenade.